What Kind of Leaders Do You Admire? And Why? I have a clear memory of talking with my Mom about Barbara Jordan. I was months away from voting for the first time and Barbara Jordan had delivered a powerful speech to the U.S. House of Representatives Judiciary Committee regarding the impeachment of President Nixon. My mother told me that she wished she could vote for Barbara Jordan for President. This is especially interesting considering the fact that it would take another 40+ years for a woman to be nominated by a major political party as their candidate for President. But Representative Jordan was extraordinary: brilliant academically and a person of elegance and enormous integrity. This opinion piece by Senator Jeff Flake yesterday made me think about Leaders We Admire. For Senator Flake, President Reagan was among those leaders “who awakened my civic imagination and inspired me to want to be an active part of the American experiment.” Who are those political leaders for you? Imagine electing candidates who make us proud. Some of us did this on Tuesday. And some of us chose lesser evils or a people whose names were familiar or candidates with whom we share some but not all political opinions. Even if we disagree with each other, there is comfort and hope in electing leaders we respect. I would love to hear what leaders you admire and why. Any party. Any time period. Any country. 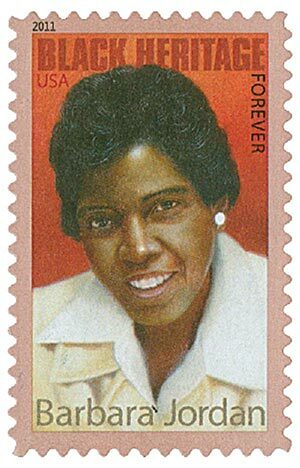 Image of Barbara Jordan (1936-1996) – U.S. Representative from Texas and recipient of the Presidential Medal of Freedom. This stamp was first printed in 2011. Totally true. Has this always been the case or is it a 21st C thing? Hi Jan. I admire our former Congressman from NY-22, Richard Hanna. Richard is a Republican who did not toe the party line, voted his conscience and represented this district well. He served 3 terms and became weary. He was succeeded by Claudia Tenney, who is a Trump acolyte.